The Giant Hogweed is a replica of the plant Heracleum mantegazzianum, an intrusive and unstoppable weed, with a phototoxic sap that causes serious burns. It spread rapidly in Europe and North America since it was introduced as an ornamental garden plant in the 19th century, and today it is classified as an invasive species, threatening both economical and ecological values. My 8-meter-long giant hogweed stem is resting in loops of black nylon straps attached to the ceiling. It sprawls in all directions, elongated and hairy. The decision to leave the botanical truth and paint the hogweeds hollow interior pink, is an attempt to turn the detested plant into a body and to connect hogweeds taking over a landscape with the way love and desire totally overwhelms both body and mind. The work was developed during a research trip to Latvia supported by IASPIS (2015). 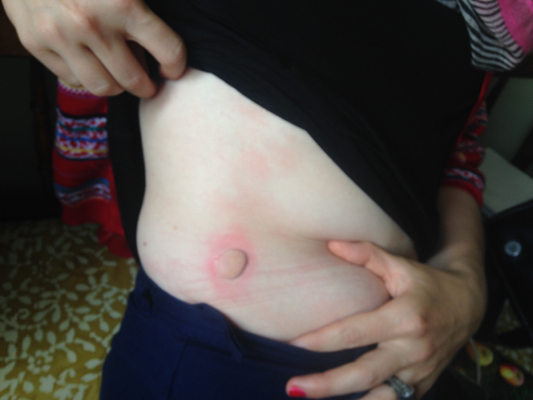 A version of the project, including fake bilsters made from gelatine and sugar, mimiking hickeys from close encounters with hogweeds, was part of Survival k(n)it 7, Riga (2015), curated by Latvian Center for Contemporary Art. Later versions of the work was produced within Tensta konsthal'ls Tensta museum. 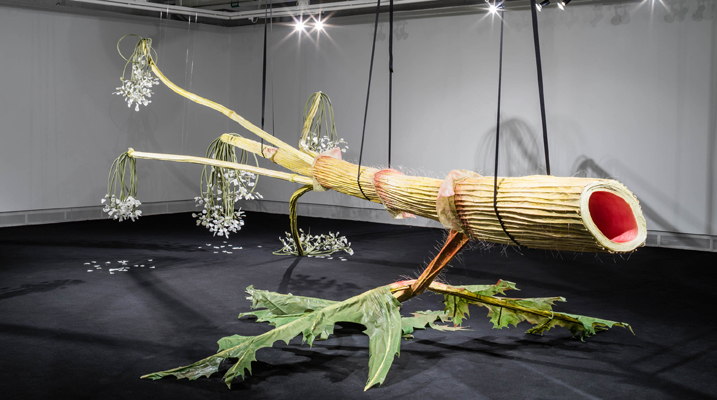 The Giant Hogweed was on view at the solo show Future Flourish / Det frodas i framtiden, at Tensta konsthall (2016) and part of the 11:th Gwangju biennal, The 8th Climate (What does art do?) (2016). Photo credit (image 1): Jean-Baptiste Beranger.